Please few our sailing schedule at http://www.devonsailingexperiences.co.uk/devon-sailing-schedule/ before booking. Our day sail experiences from Plymouth are a great option for people who want to give sailing a try, or perhaps just want a fun day out on the water. You don’t need any prior experience to come sailing with us, and you can get involved as much (or as little!) as you like. Even if you have sailed before, our day sail experiences give you an ideal opportunity to brush up on your skills and increase your confidence on the water. Come and meet us at Meet us at King Point Marina, Plymouth (PL1 3EF) at 9:30 am. Sail until 4:00 pm. 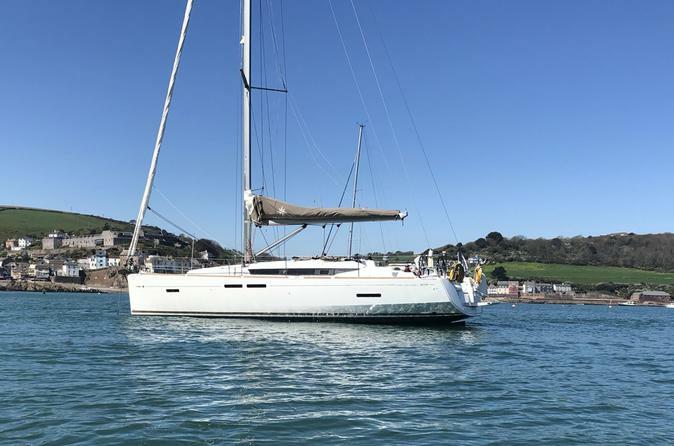 During your day sail, you will sail our 41′ sailing yacht in the sheltered waters of Plymouth Sound. Our experienced skippers will encourage you to helm, drop the anchor and trim the sails. Because we will only book a maximum of 5 guests onboard your day sail, you have plenty of hands-on experience. Skipper fees, mooring fees, fuel and a light lunch (home-made sandwiches, fruit, crisps, snacks, juice and hot drinks) whilst underway. Layers of warm clothing (even in the summer), waterproof jacket, waterproof trousers, flat non-marking shoes, towel, soft travel bag (as hard bags are difficult to stow), sun cream and sunglasses.